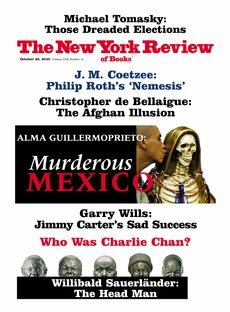 In 2002 I received a subscription to the New York Review of Books (NYRB) as a Christmas gift. I’d never read it before. In fact, when my first issue arrived I was expecting the New York Times Book Review. I was surprised with what actually showed up in my mailbox. But it was a pleasant surprise. In the years since I’ve religiously renewed. Not that I’ve always agreed with what I’ve read. Anyway… my obsessive and argumentative nature aside… the NYRB always leaves me with something to think about. Years ago it was a great article on patents and pharmaceutical companies that I forwarded to all my friends. Or there was John Banville’s lacerating (and awesome) review of Ian McEwan’s novel Saturday. Recently I read a surprisingly unbiased look at the Tea Party Movement by Jonathan Raban (3/25/2010 issue) which, while not changing my vote, definitely opened my eyes. The NYRB political coverage isn’t always even-handed (they definitely lean towards the Left), but its writers are thorough. At this year’s Book Bloggers Convention one of the speakers joked that the war between book Reviewers and the book Bloggers was over. The Bloggers had won. I’m not sure how much of a victory that is. Too many newspapers are dropping their book review sections. The one’s that remain are even more important than they were before. Not only for readers, but as a resource for Bloggers. Individual issues of The NYRB can be pricey, so I recommend visiting the website. (OH! and of course they have a BLOG). And here’s the New York Times review of the book I didn’t finish in time. P&P&Z (a.k.a. – Pride & Prejudice & Zombies by Seth Grahame-Smith & Jane Austin) is more of a novelty item than a novel – like a rubber chicken or glasses with googly eyeballs. Those who are expecting Monty Python’s (even Quentin Tarantino’s) version of Jane Austen will be disappointed. The novel (i.e. – the text) is no longer funny. The book, as an object, has become the joke. Jane Austen’s original Pride & Prejudice is a very funny novel. That sometimes gets lost in the endless “sequels” and Colin Firth fan clubs. It’s filled with great lines, smart humor and manages to feel contemporary despite being the mother of all period costume pieces. It’s not a book to get you a date, but it’s become a comfort book for a lot of women. Yes, I said women. Normally I’d fight gender stereotyping a novel, but….it is a truth universally acknowledged that the reading demographic for Jane Austen novels is scewed pretty heavily on the side of females. (Sorry, it’s mandatory to misuse that quote ). So, when Seth Grahame-Smith took Pride & Prejudice and added the “& Zombies” a lot of hopes were raised. Finally the crossover book that Austen lovers had been waiting for. It was an opportunity to convince skeptical partners to try Jane Austen with an open mind. Zombie lovers – a seemingly growing demographic of which I am a part – would think they were reading about… well… zombies and before they knew it they’d be picking up copies of Persuasion at Barnes & Nobles. Jane Austen would infiltrate the hipster ranks. Chaos would ensue. People would actually watch that horrible Keira Knightly adaptation, waiting with bated breath for the hair dye to run down her face. An added plus was that P&P&Z just looked funny. Which I guess was the actual point. Who, then, would have anticipated that the zombies, cleverly referred to as “Unmentionables” (the first and last clever thing I encountered in this book) could change the character dynamic of an entire novel? Characters like Mary Bennet & Lady Catherine are given a purpose – even worse employment! – fighting zombies and protecting the surrounding countryside. The result is surprisingly boring. The addition of a purpose makes reasonable all the puffed-up self importance, pride, and class prejudice that was funny in the original. It renders characters all but unrecognizable. Look specifically at what has happened to Mary Bennet, a complete bore as imagined by Austen, by comparing this passage to the original. They were not the only objects of Mr. Collins’s admiration… The dinner too was highly admired; and he begged to know to which of his fair cousins the excellency of its cooking was owing. If Mary met Sarah Connor in a dark alley, my money would be on Mary. Which leads me to ask, what is the point of her character in this new version? When later on Elizabeth & Jane find Mary “as usual, deep in the study of human nature” (pg 49) I rolled my eyes. Jane Austen’s Mary was ridiculous… for Mr. Grahame-Smith she is intense. Pride & Prejudice was not meant to be intense. One would think P&P&Z even less. Literary critics have commented on the lack of historical events and context in Jane Austen’s novels. For example: Pride & Prejudice, like most of her books, is set during the Napoleonic War. The only hints of this are references to the comings and goings of the regiment stationed in Meryton. This was most likely on purpose, as I think Mr. Grahame-Smith’s version inadvertently demonstrates. His zombies, like the war would have, somehow add gravity to a novel not intended to be grave. Pride & Prejudice is at its heart a romantic comedy. In Mr. Grahame-Smith’s book that is lost. His Elizabeth Bennet is no longer bright and light heart-ed. She, like the rest of the characters, has become preachy, sermonizing and in danger of taking herself waaay too seriously (much like the original Mary Bennet). Take this enchanting little speech by Elizabeth to Mr. Collins after encountering zombies on their walk to Meryton. …Elizabeth took the pipe from Mr. Collins’ mouth, blew on the glowing tobacco, and threw it over the side. “That was a gift from her ladyship!” he cried, loud enough to draw the attention of the zombies below. They looked up and let loose their terrible roars, which were cut short by a violent, fiery explosion as pipe and oil met. Suddenly engulfed, the zombies staggered about, flailing wildly and screaming as they cooked. Jane raised her Brown Bess, but Elizabeth pushed the barrel aside. So much for her fine eyes. If the characters in a romantic comedy are not light & ridiculous then what’s the point? I suppose there are the zombies and ninjas. Mr. Grahame-Smith never quite pulls it off. His zombies and the Austen world never mesh. They lack authenticity. The book degenerates into a kind of Mad Libs where instead of random words “Unmentionable”, “ninja” and “the deadly arts” are inserted into the blanks. Ultimately he isn’t in love with the material. As a result he continuously misses the point, as well as the humor, and goes for the easy joke of introducing zombies and ninjas directly into the original prose. But it’s only one joke. One joke that gets old quickly when it’s stretched for 320 pages. What to Do with Your Copy (instead of reading it): Mix it in with some books on the guestroom nightstand. Use it on your coffee table as a coaster. Display it like the conversation piece which it is. What to Read Instead: I think I prefer my zombies in films and video games.